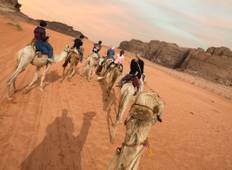 Find the right tour for you through Aqaba. We've got 119 tours going to Aqaba, starting from just 3 days in length, and the longest tour is 43 days. The most popular month to go is October, which has the most number of tour departures. "Tour all round was brilliant, the group was great and lead superbly by Ibrahim, he..."
"Wonderful tour in spectacular Jordan. Amer was a wonderful guide giving us an amazing..."
"This was a great experience! A big thanks goes to our super knowledgeable guide Norbert!..." "Wonderful tour. Excellent itinerary, with both the right mix of experiences and the..."
"Ok so I’m writing this review as the partner named by my culture/history loving..."
"I believe that, if you are travelling alone, you must do group tours. It really helps..."
"As a very busy person that may only have a few days to visit desired destinations,..."
"The actual tour saw amazing sights with great people. The bikes we used were not..."
"We had an amazing time in Egypt. Sameh was one of the best tour guides I’ve gone..."
"It's a great tour that allows you to see the best of Egypt and Jordan. The guides..."
"An exceptional, comprehensive, and invaluable tour of Jordan's most famous sights..."
"Amazing tour, amazing country, amazing people! X"
"I am very glad that I booked this tour. we were picked-up on time and saw all the..."
"Jordan is an amazing country with outstanding places and people are welcoming. The..."
"Great itinerary with a couple of tweaks it could improve the Jordan experience."